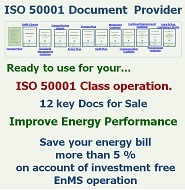 A quick note: We had an inquiry, a person from the USA "Do you offer ISO 50001:2018 document...". Our consultancy and training is now based on updated ISO 50001. However we are in the process of udating our posted document including the templates to ISO 50001:2018 compatible scheduled completion by the end of March 2018. We have to apologize to the contacted person form the USA that we accidentally deleted the message and would appreciate resend the message. Energy Team is the leading Energy Monitoring System (EnMoS) provider in Europe because of their dedication not only to supply the hardware/software that they manufactured but to stay with the users ensuring energy performance improvement is accomplished and further improvement is obtained by proper operation. Energy Team follows the ISO 50001:2018 guideline in ensuring their solutions are benefitted by users in achieving energy cost reduction through continual energy performance improvement operation. Energy Management System (EnMS) is a systematic way how "Active Energy" and "Passive Energy" work together. In order to work together, we need to communicate and understand each other. 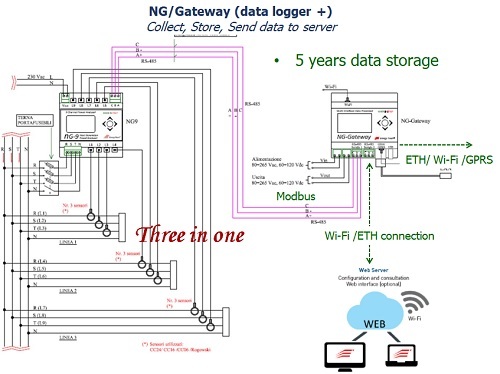 Energy Monitoring System (EnMoS) is the vital part in EnMS to manage energy and understand each other. Energy Team's EnMoS approach is not only to provide the best quality hardware and software, but also to proovide EnMoS solution for the business owners specific to their needs so that to gain continual performance improvement in their business operation to sustainability. Energy Team's monitoring devices and software benefitted us whenever conducting energy audit. Energy Team's solution is that the devices can be used both protable or permenent ways. Software cost coverage is not on a entire system but on each device use so very economical way to start small and gradually building up the system. When we completed energy audit, most clients asked us to leave the Energy Team's devices in their premises (within EnMS boundary) for permanent use. 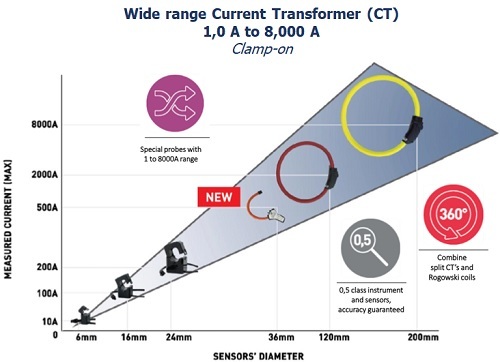 Small size meter and clamp-on CT make wiring and installation so flexible to reducing significan load at start up, involving no or little time for shut-down. 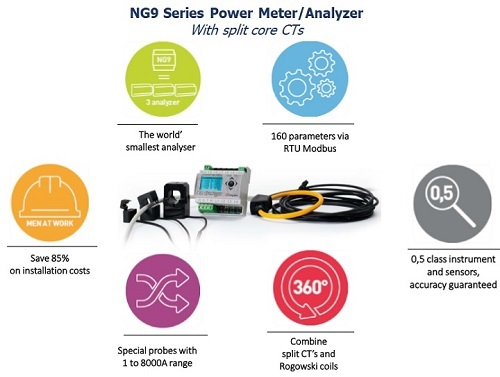 The meter uses a compact Gateway (data logger/storage/software interface), the same size as the meter but can do eneormous job to use the software to the site needs. 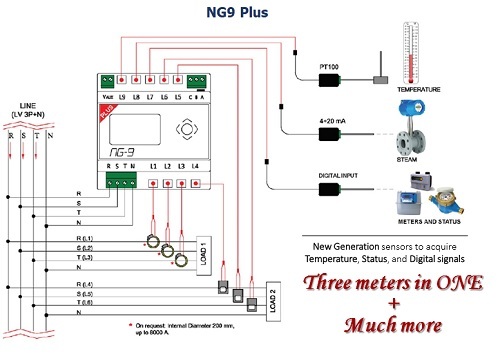 When you are using already installed based EnMoS, Energy Team flexible solutions provide easy installation and measuring of specific area that existing system cannot cover or due to changes in business set up or production line. For long term benefit, EnMoS should not be built at once, but by continual and consistance performance improvement. Export Sales & Trade Marketing Manager, Energy Team S.p.A.
"Active Energy": PEOPLE..."Passive Energy": Electricity, fuel, water, etc. "PEOPLE are the key element of energy"
Since our 2015 edition we have been stressing "PEOPLE are the key element of energy" and should be defined as one of the important energy items. After extensive energy management work with various business operators, we decided to classified "Active" and "Passive" energy. We define people and organization as "active", and others as "passive" or "reactive". 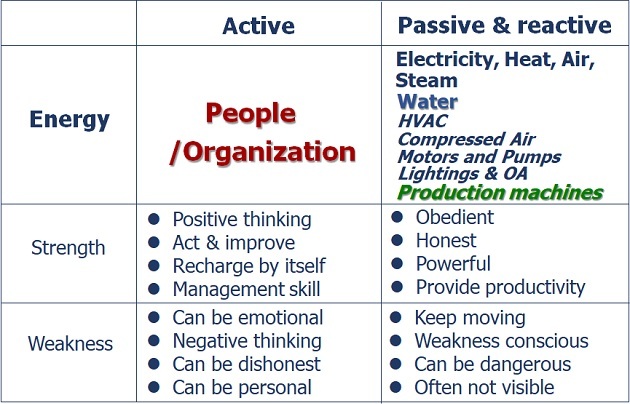 Active and passive energy each has strength and weaknesses. We then experienced many business owners simply surrender improvement opportunity simply closing eyes on the weaknesses of the active energy. Can we solely rely on technology for efficient energy use of your daily business? 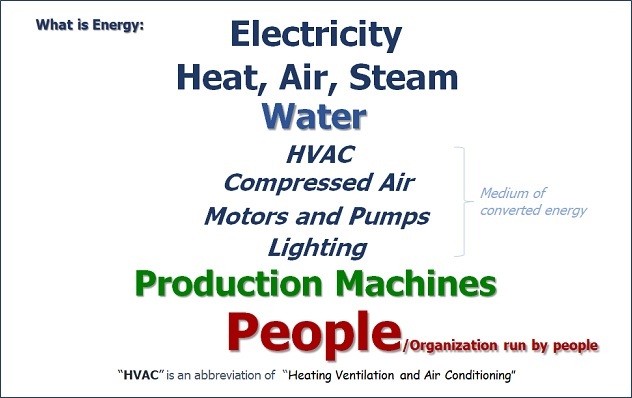 Energy efficiency highly benefitted from technology in the scope of converted energy (Air compressors, Chillers, heat pumps, boilers, motors, pumps, etc.) as well as in the production & processes machines. After reaching the "Best Practice", we are struggling now how to sustain the state of the "Best Practice". It is much easier to save than sustain the best position. Once we benefit from technology, what is the next step? We need to assess ourselves: are we using the technology in the right manner to our daily business practice? It is the time for the active energy to properly operate the technology to optimize the use of energy: “The least energy use for the defined amount of business output”. Active energy has a task to be open minded, observant and positive thinking to identify opportunities and to assess how those opportunities can be converted to improvement actions. The top management has to understand that active energy has "heart", "pride" and "motivation" and requiring direction how optimize the skill of active energy. The top management then has to understand energy is not only engineering matters but also business matters. A blend of business oriented Engineer & positive thinking non-engineer is the answer to the Energy Efficient operation. Energy is not solely engineering matter. Energy is also operational matter. Energy is business...engineers and non-engineers good communication working team is the best blend for the healthiest operation for quality business outputs. Energy is a matter of the utility facility department. EnMS will increase their workload therefore increasing cost. Even a slight loosening of tap that a child can fix should be fixed by maintenance people by rule. EnMS in daily operations is to simply switch off lights at lunch time by office workers. Energy cost is so little compared to the revenue amount and therefore energy matters are low on their top management’s priority. "Energy" is a technical matter so an energy manager should have an engineering degree. The world's largest corporate sustainability initiatives.